332 pages | 8 B/W Illus. 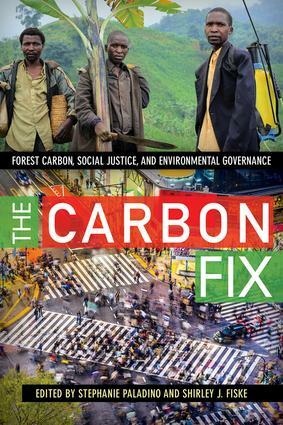 Given the growing urgency to develop global responses to a changing climate, The Carbon Fix examines the social and equity dimensions of putting the world’s forests—and, necessarily, the rural people who manage and depend on them—at the center of climate policy efforts such as REDD+, intended to slow global warming. The book assesses the implications of international policy approaches that focus on forests as carbon and especially, forest carbon offsets, for rights, justice, and climate governance. Contributions from leading anthropologists and geographers analyze a growing trend towards market principles and financialization of nature in environmental governance, placing it into conceptual, critical, and historical context. The book then challenges perceptions of forest carbon initiatives through in-depth, field-based case studies assessing projects, policies, and procedures at various scales, from informed consent to international carbon auditing. While providing a mixed assessment of the potential for forest carbon initiatives to balance carbon with social goals, the authors present compelling evidence for the complexities of the carbon offset enterprise, fraught with competing interests and interpretations at multiple scales, and having unanticipated and often deleterious effects on the resources and rights of the world’s poorest peoples—especially indigenous and rural peoples. The Carbon Fix provides nuanced insights into political, economic, and ethical issues associated with climate change policy. Its case approach and fresh perspective are critical to environmental professionals, development planners, and project managers; and to students in upper level undergraduate and graduate courses in environmental anthropology and geography, environmental and policy studies, international development, and indigenous studies. "This book, compiled by Stephanie Paladino and Shirley J. Fiske, is an important addition to the REDD+ literature. The carefully reviewed chapters in a coherent manner depict the work experience of the editors and authors in a coherent manner. The book has 19 chapters divided into five sections. Most of the chapters authors are anthropologists by profession; and their contribution emphasizes the societal implications of carbon offsetting." 2. Profits and Promises: Can Carbon Trading Save Forests and Aid Development? 11. Doing REDD+ Work in Vietnam: Will the New Carbon Focus Bring Equity to Forest Management? Stephanie Paladino is an environmental anthropologist with the Center for Applied Social Research, University of Oklahoma, USA. Her research focuses on how environmental governance strengthens equity and sustainability, most recently in the areas of carbon forestry offset markets, oils spill response, ecologically protected areas, and the Rio Grande basin. Shirley J. Fiske is Research Professor at the University of Maryland. USA. She is an environmental anthropologist with career experience in the executive and legislative branches of the US government in ocean, climate change, and natural resources management policy and governance. She was awarded the 2016 Solon T. Kimball Award for public and applied anthropology by the American Anthropological Association.